Jimmy Stewart: Winchester ’73 (1950) – Did You See That One? 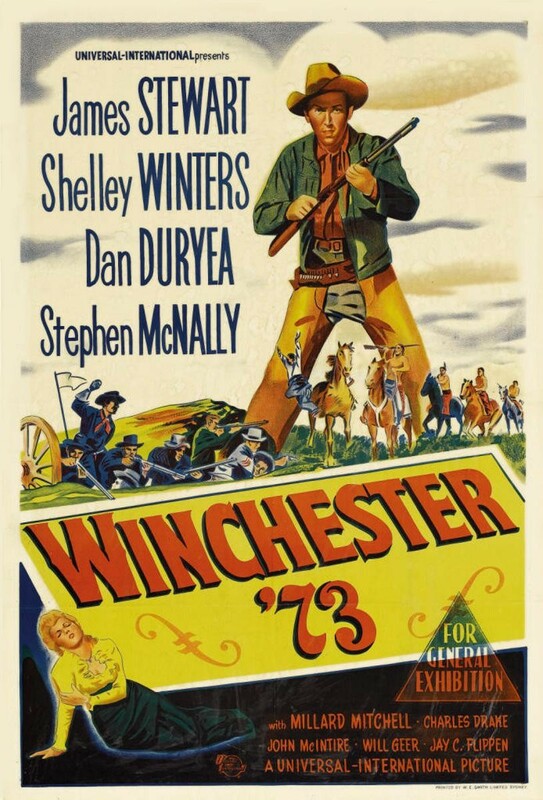 Winchester ’73 is a landmark film for Stewart and for the western genre as a whole. The movie stars Jimmy Stewart, Shelley Winters, and Dan Duryea. This was the first and only time that Winters and Stewart would share the screen. Dan Duryea would later appear in Thunder Bay and The Flight of the Phoenix with Stewart. This was also the first of eight films that would bring Stewart together with director Anthony Mann. Winchester ’73 follows the journey of a prized rifle as it brings grief to all who possess it. 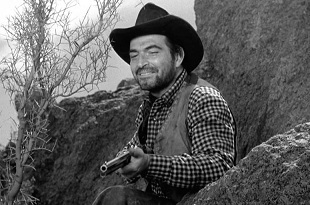 As Lin McAdam (Stewart) pursues Dutch Henry Brown (Stephen McNally) across the country they find themselves competing for the Winchester rifle in a contest in Dodge City, Kansas. When the rifle is stolen it begins it’s journey from owner to owner as bad men fight for the prized gun. Meanwhile Stewart meets Lola (Winters) and Steve (Charles Drake) who are traveling together. When Steve and Lola find themselves in the grips of Waco Johnnie Dean (Duryea) it’s up to Lin to save them. As he works to save them he’s forced to confront Brown and face the real reasons behind his pursuit. The brilliance of this movie is the dark and selfish nature of Stewart’s character. Until this film westerns were known for good guys and bad guys. This film blurred the line and created a more psychological storyline. 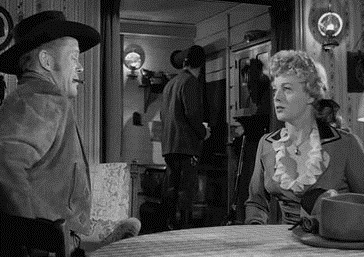 Anthony Mann was not known for westerns prior to this movie, having made several film-noir films in the years preceding this. With Winchester ’73 you can see the influences of the film-noir style on the camera work and lighting. The acting throughout the movie is wonderful. Stewart’s character is conflicted and revengeful, and dark, all elements that were uncommon from his previous roles. Winters does a good job being more than just a damsel in distress throughout the film. Dan Duryea is equally good as the hapless Waco Johnnie Dean. Future stars Rock Hudson and Tony Curtis are also featured in smaller roles throughout the film. Ironically, this film was only made as part of a concession to Stewart from Universal-International. Stewart agreed to make Winchester ’73 only after the studio agreed to make Harvey. Under the agreement Stewart received a portion of the profits from both movies. Ultimately both of these movies were successful, making this a good deal for the studio and Stewart. 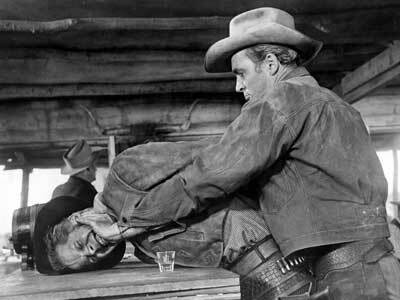 Anthony Mann and Stewart wouldn’t have to wait long to work together again. They would work together on the movie Bend of the River in 1952. The 84th Academy Award nominations (and my predictions). He’s my favorite actor and his career is fascinating to me. I’ll be continuing on his films for some time. There are over 80 total and I’m still gathering copies of some of them. Pingback: Jimmy Stewart: The Naked Spur (1953) | Did You See That One? Pingback: Jimmy Stewart: Thunder Bay (1953) | Did You See That One? Pingback: Joe Kidd | Did You See That One? Pingback: Red River | Did You See That One? Pingback: Jimmy Stewart: Two Rode Together (1961) | Did You See That One? Pingback: Jimmy Stewart: The Man from Laramie (1955) | Did You See That One? Pingback: Jimmy Stewart: Bend of the River | Did You See That One? Pingback: Jimmy Stewart: Night Passage (1957) | Did You See That One? Pingback: My Darling Clementine | Did You See That One?